Last month, we took a family trip to Thomas Land UK and, after the visit, we found ourselves with a few hours to spare before we could board our ferry back to Ireland. We were travelling by car, so we looked at things to do with children in the East Midlands, and soon found out a place that caught our attention: the British National Space Centre in Leicester. Space is a subject we all find fascinating, in our household: both my husband and I love looking at the night sky and just recently we had noticed the kids seemed to follow our amateur astronomer footsteps: my son, in particular, is enchanted by the idea of space and with great surprise of anyone who is bothered to listen, he is able to recite the names of Jupiter’s main moons! So, when we saw that the centre was open to the public and described as a family friendly attraction, we had no doubt: after a longer than expected drive (never, ever go on a road trip without a map! ), we arrived with a few hours to devote to space exploration. 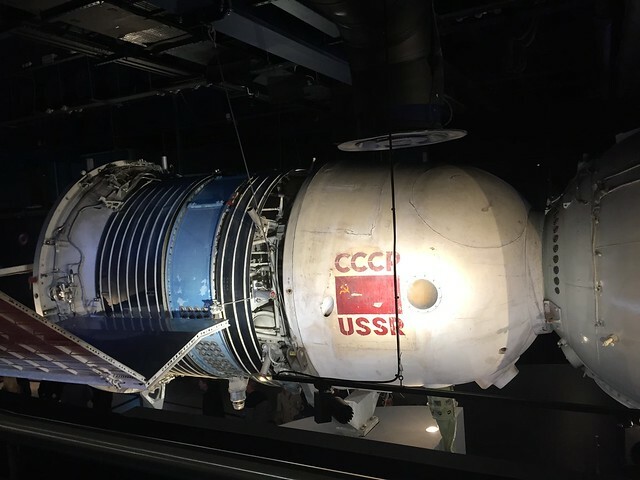 The National Space Centre in Leicester turned out to be a fantastic choice for a family day out and proved interesting and fun both all adults and children! The National Space centre is located just outside Leicester City and from the A6 (where you are likely to come from if driving) is very well indicated by brown signs with a drawing of a space rocket. The choice of a rocket as a symbol of the centre has a special reason that goes beyond the simple mental association with space exploration. When you first pull over to the Centre your eyes are drawn to its most spectacular feature: the rocket tower. A 42-metre tall semi-transparent tower, this part of the building hosts two of the biggest artefacts kept in the centre, a Blue Streak and Thor Able rocket. You can make out their shape as soon as you enter the main parking space, but the rockets are not just there to be admired from afar: they are a fundamental part of the exhibition and in the course of your visit you will get well acquainted with them, their imposing presence an immediate reminder of the magnitude of the space exploration endeavours. the Centre is equipped with a large pay and display parking. Car fees can be paid at the machine outside the centre but, more conveniently, if you are not carrying cash (or have kids getting soaked in the rain) at the main ticket counter. All you need is your plate number and this will be recorded, without you having to go back outside: very handy indeed. Tickets can be booked in advance or purchased at the entrance on the day of your visit. At the time of our visit, an adult ticket was 14£ and children under 5 go in for free. 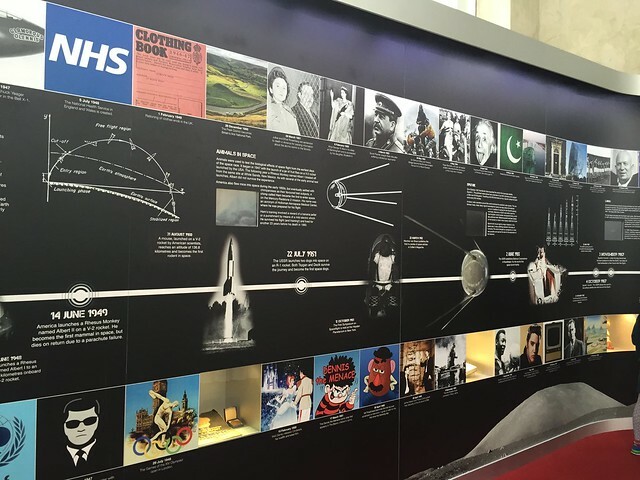 The Space Centre is organised on different levels and it contains an impressive amount of specimens, installations and educational materials aimed at making the public familiarise with space. We entered thinking of the centre mostly as a children attraction but while it is indeed very family friendly, it is also well equipped to teach adults about the universe. The appealing installations are accompanied by detailed explanatory panels that dig into the history of astronomical exploration and facts. It is, indeed, rocket science! You enter the centre at the ground floor: the smiling carboard figures of Tim Peake and smaller cartoon shapes immediately give a jolly and friendly touch. This level is dedicated to science exploration and it’s a full immersion in the wonders of the universe and the study of it over the course of the centuries. Thanks to interactive installations here is where you learn about planets (each of them has an individual booth with information) but also about weather patterns and how calculations and observations shaped our knowledge of the sky. Entering the National Space Centre in Leicester! This floor is also home to an absolutely breathtaking life-size mock of the Columbus model of the International Space Station (ISS): entering it is truly an experience! Walking in the module you get a glimpse of the complexity of the station but also of how alien (literally) life must be for the astronauts who spend months in the confinement of the module. after seeing recently on tv the last space walk, getting this close to the actual ISS was incredible and also gave us a funny insight on how the human brain works: of all the amazingly complicated systems aboard the space station, the one thing everybody noticed and discussed inside it, was how small the shower cubicle is! After seeing recently on tv the last space walk, getting this close to the actual ISS was incredible and also gave us a funny insight on how the human brain works: of all the amazingly complicated systems aboard the space station, the one thing everybody noticed and discussed inside it, was how small the shower cubicle is! Still on this floor, the museum hosts a planetarium dedicated to Sir Patrick Moore, with shows at regular intervals, and the Tranquillity base, a place where you can become a trainee astronaut for a lunar base! Unfortunately, despite how fun these two attractions seemed, we had no time to negotiate the long line: the tranquillity base is part of the main gallery exhibition, and a bit of patience would have probably been sufficient to get in, while access to the planetarium is organised in shifts. We were allocated a shift at 2 pm (despite getting to the centre at about 11) and while I have bo doubt that it would have been incredible, we had to leave before that time came or we would have literally missed our boat! After the planetarium debacle, we moved to the rocket tower that so much had impressed us from the outside. a glass lift brings you up the three level that make up this part of the exhibition and what you see it’s really impressive. The rockets are imposing but what you learn through the videos and the panels is, at last for adults, more interesting that the actual artifact: with videos documents and reconstructions, you follow the development of the Russian and American space programmes and informative panels help put these endeavours in the context of the social and historical climate of those years. The kids found this part of the exhibition particularly fun (here is where the photos of them with spacesuits are taken) but I believe my husband and I got the most out of it and left the centre with many ideas and considerations about what it means to learn and discover our universe. Because of our limited time we were not able to see in depth all the centre had to offer but even with a couple of hours we left with the feeling of an incredible place and one we would definitely see again next time in the UK with or without kids.